“In January of 2004, I received a diagnosis that changed my life. I was diagnosed with Lupus, an autoimmune disease that in my case attacked my kidneys and brain. Due to the intensity of the initial “flare up” of the disease, I became renal insufficient and eventually faced kidney failure. Amazingly, through great medicine, wonderful family and friends, and an enormous amount of support, I became stronger and healthier and miraculously, my kidneys partially regenerated. I no longer depend on dialysis and by regulating my diet, I depend on fewer medications. Pretty inspiring right?? That awesome chic is my cousin (who we will call J). In order to stay healthy, her body requires that she subsist on a low-sodium diet. Instead of despairing for her tastebuds — she decided to rejoice it, and became an amazing low-sodium chef-extraordinaire! This is her blog. So when J asked me to create a low-sodium recipe to celebrate February being National Heart Health Month, I jumped at the opportunity. And now I bring you…….. Using an electric mixer, beat the Earth Balance and the sugar in a large bowl until fluffy, about 2 to 3 minutes. Add the vanilla and beat until blended. Stirin milk, lemon zest, and pistachios. 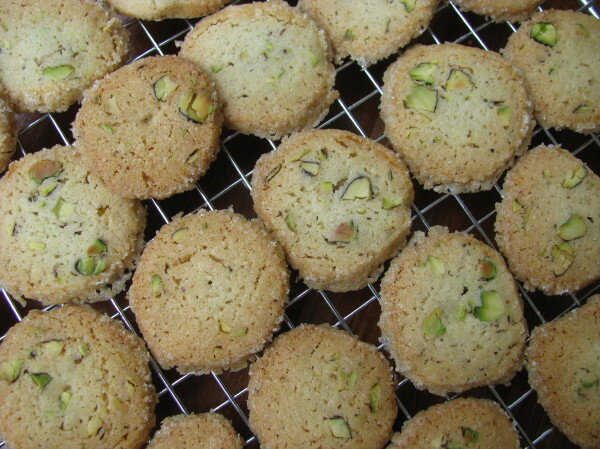 Stir in the flour and cardamom. Mix to form a soft dough. Cover with plastic wrap and pop in the refrigerator for about 30 minutes. Preheat the oven to 350 degrees F. Remove the dough from the fridge and make tablespoon size dough balls. Place the dough balls on a greased cookie sheet. Flatten the dough little with your finger and bake about 13 minutes, or until lightly golden. Remove from the oven an dlet sit on the cookie sheet for 5 minutes. Transfer to a wire rack. Enjoy with some ginger tea (my personal favorite). Love your heart. Love your life. And as my dear cousin J would say…CHOW ON! Amazing. These are bitchin’ just like you! My pops will love these (and so will I, but that’s obvious because I like cookies. A lot). Thank you for participating – love that my cuz was a contributor! Happy long weekend my dear and let’s cyber cook together again soon! These look so yummmmmyyyyyy! I love vegan goodies. Fed ex me one? Or two? Or ten? Please? Sodium girl – since I don’t eat scallops OR bacon, your yummy substitute looks awesome!